Podetia fragile, erect, to 2 cm tall, the base dying and growing from the apices; subterete or flattish, more or less sympodial with few branches but many short, divergent, muricate black-tipped side branches, usually forming tufts when undisturbed; yellowish straw-colored, to brown in strong illumination, usually with a whitish or violet pruina; lacking soredia or isidia, only slightly if at all foveolate, the interior hollow with very loose arachnoid hyphae scattered in the cavity. Cortex firm, 25-50 μ thick, of radiatingly oriented prosoplectenchymatous hyphae, the cells very thick walled and not clearly distinguishable, yellowish or brownish, sharply differentiated from the loosely arachnoid medullary hyphae which are pachydermatous, 7 μ diameter; the algae scattered or in small glomerules in the outer medulla, 7.5-16 μ. Apothecia on the tips of side branches, 1-3 mm broad (Lynge reported to 6 mm), the disk flat, smooth, shining, chestnut colored; the rather thick lecanorine margin coarsely crenulate or folded, the interior hollow with loosely arachnoid filaments as in the podetia; the cortex as in the podetia, hymenium thin, 50 μ, the subhymenium a hyaline layer, 25 μ thick under the hymenium of short cells more or less oriented flatwise to the hymenium; the hypothecium brownish or yellowish, 25 μ thick, dense, a layer of dispersed algae in the arachnoid medulla under the hypothecium; asci pyriform with a very thick gelatinuous tip, 10x30 μ; spores biseriate, spherical, 5-6 μ diameter with thick wall; paraphyses unbranched except at base, septate, clavate-capitate, the tips brown, 4 μ thick, with thick walls and very slender lumina. Pycnidia rare, globose, conidia cylindrical, straight, 5-6 x 1 μ. Reactions: cortex K- , C- , KC- or + yellow to pink; medulla K-, or KC+ red and P+ red when physodalic acid is present. Contents: usnic acid in the cortex and usually physodalic and physodic acids in the medulla (see Thomson & Bird 1978 for details). 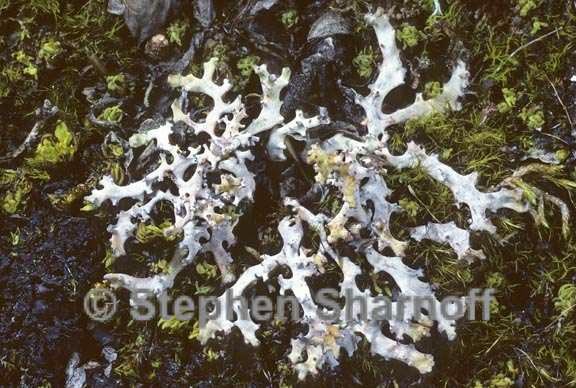 D.ramulosa is a calciphilous lichen which grows in a wide variety of tundra habitats, reflecting this also in the variability of its morphology. In very dry Empetrum-Arctostaphylos heaths it grows short and fragile, the branches becoming scattered rather than in dense tufts. In the more moist Carex and Eriophorum tussock tundras it grows on the tops of the tussocks among the sedges and tends to be larger, more luxuriant, and tuft-forming. The formation of apotheica, like that in D. arctica, is more frequent adjacent to late snow patches, above the patches where the snow melts away. This is a circumpolar arctic-alpine lichen which ranges southward in North America only to Alberta in the west and to northern Quebec in the east.